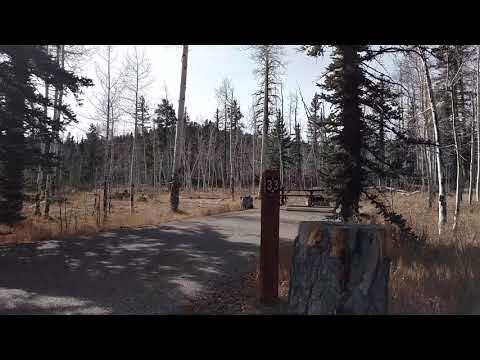 Take Highway 14 from Cedar City, Utah, 28 miles east to Duck Creek campground. Campground turnoff will be on the right hand side of the highway, before you reach Duck Creek Village. doesn't matter if your tent camping or using an RV I guess I'm kind of partial to this campground my family has had our reunions here for 100+ years. There are freshwater places where you can hook up and get fresh water and there is a RV clean-out spot, and there are restrooms. Beautiful campground with tall pine trees & clusters of aspen. Well-spaced & large sites with level concrete driveways (good for RV parking) & concrete picnic table/fire pit areas. Clean restrooms, water on taps, close to Duck Creek Reservoir. Friendly hosts & very affordable. Close to many hiking trails. Love Utah's Forest Service Campgrounds! This is a nice campground where your sites are not too crowded. You're stuck into the trees nicely (for the tent sites, RV are more open) and i think the tent first come first serve sites in loop D and E are better since you're further away from the highway and get less noise. You have your standard table and fire ring plus a good amount of potable water spigots around. There aren't as many bathrooms as you'd think for the amount of people there are (this is a pretty heavily used national forest campground). For the most part, I really enjoyed this campground. Though a little difficult to find, the campground is incredibly beautiful and smells amazing. You can also make reservations, and it is recommended. It is tucked into a woodsy area and the sites are very private; it almost felt like we were the only ones there. Each site comes with a picnic table, fire ring, and bear bag hook (yes, this is bear country). The only things I disliked were that the table wasn't movable, and there is a giant patch of cement that took up most of the site space. There are flushable toilets and sinks, but no showers. We went on a hunt to find showers since the website said there were some in town, but were told that there were no longer any available. However, after stopping at the Duck Creek Visitor Center across the highway, we finally found out that there are pay showers at the Pinewoods Resort. They were $5 each for an unlimited amount of time, but beware, the hot water runs out quickly. Duck Creek Village doesn't have too much to offer, but the scenery is beautiful. Also, be sure to make a stop at Navajo Lake, just down the road from Duck Creek Village; the views are breathtaking. Despite our shower adventure, this is definitely a campground I would stay at again.